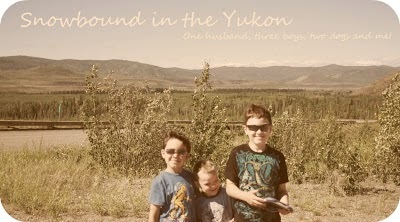 Snowbound in the Yukon: Thoughts and memory lane. The Secret, I've been reading it. Okay i read half of it in one day and haven't picked it up since. But I think it's true! When we went to Edmonton, for weeks before I kept saying it would be the trip from hell traveling with 3 little kids in the car. And it was, it was stressful and I had no patience at all. It was just a bummer trip all around. I went to Whitehorse on Wednesday, yesterday and came back today. A six hour drive each way. I had all three kids with me and I was by myself. The night before I said I was going to have a great trip and I did. The kids were great, I kept my patience. It was a lovely trip for the most part, rushed but I really did need some things from the city, as I call it. It a 35000 people city compared to my 1500 people town. SmartGuy did have one meltdown, when we went to McDonald's the first day and he got the Baby Shrek's in his happy meal. We haven't even seen the movie yet but he was devastated that he couldn't get the Shrek figure instead. It really was cute! We saw 5 rabbits and 2 porcupines in the ditch. Oh, I never told you about the animals we saw on the road back from Edmonton. Okay, two many caribou to count, about 2 moose, 1 doll sheep, 5 rams (can't remember what they are called), too many buffalo to count, a few deer, an Eagle. The sad part through this one area there were about 13 dead moose and then later 3 dead buffalo, it must have been from the winter, since the were decomposing on the side of the road. I love seeing wildlife, as long as it's not a bear. I've been thinking today about secluded spots. We visited friends last weekend who had a great spot on their property that I'm totally jealous of. It's so nice and peaceful. It got me thinking about my back porch, okay, thinking about a clothesline I'm going to have Hubby put up made me think of the clothesline at the house I grew up in and it was attached to the back porch. But I can't remember where it came off the house from, has me stumped. Anyway, I was thinking about how nice it used to be to sit on the back deck, we were on the main drag back then and it was fairly quite in our back yard. I used to love to sit out there in the evening writing in my journals and writing stories. Sitting there while my father gardened just down below or having music play in the house and having it drift out to our ears. I liked sitting and listening to the adults talk, I still like that. The sound of their voices is so calming for me. I miss those days sometimes. Sparky sitting at my feet. I really miss Sparky, I'll have to tell you about him sometime.